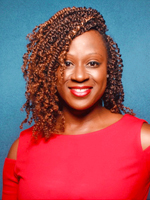 Anide J. Eustache is a seasoned marketing and communications professional, certified professional and executive coach, strategist and speaker dedicated to helping women position themselves for the lives they want to live both personally and professionally. As Principal & Founder, Garraud Consulting she focuses on providing marketing and strategy consultation services to organizations; and works with organizations to provide professional, business and personal development training and coaching that help clients achieve their business and/or professional goals. An accomplished professional, she has 20+ years of experience in the areas of strategic marketing, communications, media relations, promotions, creative and content development, high-level event planning]/management and brand positioning. She has worked within the not-for-profit, media, entertainment, sports, publishing, advertising and higher education industries. She currently serves as staff for ElevateHer Ministries, providing trauma, personal development and spiritually based training to women lay leaders globally; member of the NBMBAA; and speaks on key topics focused on professional and personal development for women and early-to-mid career level professionals. She is a champion for causes aimed towards equipping and training women and girls, urban youth, organizations and Haiti through social, professional or spiritual development. She holds a certification in Personal & Executive Coaching from the CAPP Institute, MBA in Marketing & Management from Fordham Graduate School of Business, BA in Communications & Journalism from Rutgers University and a certificate in Sports, Entertainment & Events Marketing from NYU’s School of Continuing & Professional Studies.